There is no simple answer to how much the bottom line will be for your roofing project. A bid from a contractor should be based on square footage, the pitch of the roof, accessibility, type of roofing material needed, 1- or 2- story home, removal of old roof (if necessary), roof permit, city license and labor. The average cost to replace a roof is approximately $2,000 to $12,000 depending on the size of the roof and the quality of workmanship/materials. My roof leaks, will I need to have it completely replaced? Not necessarily, leaking may result from damage to a section of the roof or from flashing coming loose. A roof failure, however, is generally irreversible and results from improper installation and/or poor choice of materials, or from the installation of a roof system that is inappropriate for the building. How should I prepare for the installation of my new roof? You should remove all loose items from your walls and shelves as the hammering may cause enough vibration to shake these items down and break them. Make sure to have your driveway and the area directly around your home clear of all vehicles, items, people, etc. 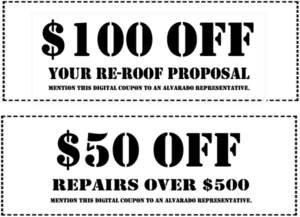 This will allow your Alvarado Roofing contractor a place to store the material for your new roof as well as an area for the dumpster to hall away old materials. Re-roof or new construction all depends on the type of roof, the weather and the required inspection(s). Generally, for a small, single-family-home it can take a few days, large commercial projects, however, may take a few weeks to months. As long as your lead contractor manages the project closely and efficiently, the project should move smoothly and finish on-time. Like any building component, roofs degrade at different rates depending on a large number of factors; the quality of original construction, the level of abuse, the level of maintenance, appropriateness of design, etc. Furthermore, we have seen poorly designed and installed roofs last as few as six or seven years before they fail and we have seen old coal and tar, built-up roofs that were 60 years old - each roof needs to be assessed on a case-by-case basis to determine the life expectancy. Most building owners, roofing contractors and designers feel twenty years is an acceptable service life. Please keep in mind that in the hot New Mexico climate, most roofing systems do not last as long as they do in other climates. Also make sure when choosing your roof, you ask what the service life is in New Mexico as you may learn that a lot of roofs do not last for the full warranty and/or manufacturer's warranties. 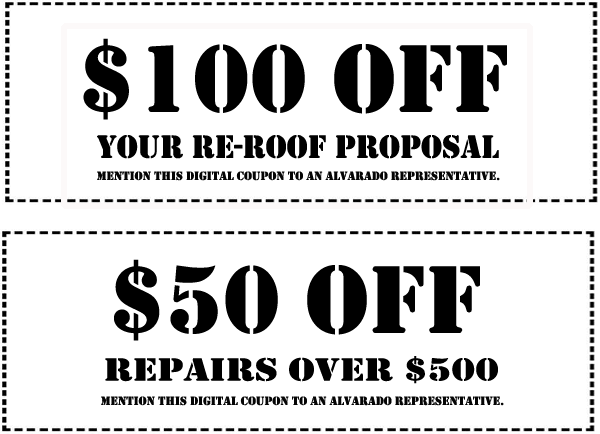 Can I do roofing work myself or should I hire a contractor? Most roofing work should not be done yourself. Manufacturer's generally will not give a warranty if you do not have a professional roofer install the product. Professionals are trained to handle the environment on the roof and the conditions that may present themselves when doing a roofing job. The dangers to a homeowner with trying to do-it-yourself could be a lot more expensive than just hiring a roofing professional to come out and do the work for you. Strapped for cash? We can help you with financing options. Installing a new roof over the top of an existing roof is generally acceptable under these guidelines: 1) A building cannot have more than two roofs. 2) No wet insulation can be left in place. 3) The roof structure must be able to handle the additional roof load. 4) The new roof must be removed once the two roof-limit has been reached thus when/if you are looking to install a third roof. When is the best time to install a new roof? This question may be interpreted two ways, so we will answer each question separately. 1) In New Mexico there really is no "bad time" to install a new roof. As we all know there are a few weeks of monsoons (rainy season) and that's it. So as a roofer, we always watch the weather and pray for no rain until the underlayment is down and secure. Winter is also fine as long as the roof is dry with no ice or snow present. 2) The question may be asked this way, "How do I know when my roof has failed?" Different types of roofs fail in different ways: - Does the roof leak in numerous locations? - Do leaks continue, despite repeated repair attempts? - Do repairs seem to make leaks worse or do new leaks develop after rainfall? - How tolerant is the occupancy to leaks? Low leak tolerance generally means the "failure" decision is reached earlier. It is generally better to re-roof at the appropriate juncture rather than pouring money and time into ill-advised repairs; but there are exceptions. All too often, roof problems are discovered after leaking or other serious damage occurs. Periodic (twice a year) inspections will often uncover cracked, warped, or missing shingles, loose seams and deteriorated flashings, excessive surface granules accumulating in the gutters or downspouts, and other visible signs of roof problems. Indoors, look for cracked paint, discolored plasterboard and peeling wallpaper as signs of damaged roof areas. You have two basic options; you can choose a complete replacement of the roof system, involving tearing off the old system, or you can do a re-cover, involving going over the existing roof. If you have already had one re-cover then you cannot go over the existing roof again. Wouldn't it be simple if there was one answer to all roofing problems? Unfortunately, there is no magic pill in the roofing market that solves all roofing problems. What we do offer is a wide selection of good products, each having attributes and faults. The key to selecting the proper roof system is to identify the specific roof design of your building and how each roof system works to meet the requirements. The price of a new roof all depends on the type of material you select, whether you are removing the old roof or not, the type of underlayment, the price of the permit and so on. Make sure that you get at least three estimates if you believe that the cost is high. However, be sure that if one person comes in higher than the other that you ask the right questions about the type of material being used and the reputation of the company. Just because it is cheaper does not mean that it is better. Sometimes the higher priced contractor is the one you want to go with because of their expertise and the quality of the materials they are using.